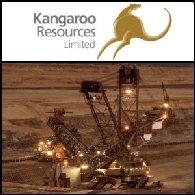 Kangaroo Resources Limited (ASX:KRL) is an emerging international mining Company with eight coal projects in the East Kalimantan region of Indonesia. The Company's projects host coking and thermal coal resources which will see KRL emerge as a significant Indonesian coal producer, with first production achieved in December 2009. KRL is committed to building a sustainable mid-tier mining house, focusing on Indonesian coal and using the considerable experience and expertise of its exceptional in-country partners to fast track development and production. 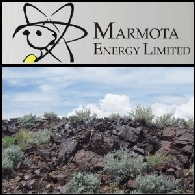 The Company's medium term strategy entails vending in valuable new coal projects, while at the same time continuing to build production in the short term from up to three existing projects. 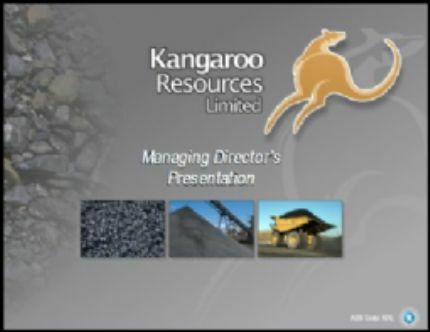 Kangaroo Resources Limited (ASX:KRL) directors present their report on the consolidated entity (referred to hereafter as the group) consisting of Kangaroo Resources Limited (KRL) and the entities it controlled at the end of, or during, the six month period ended 31 December 2011. 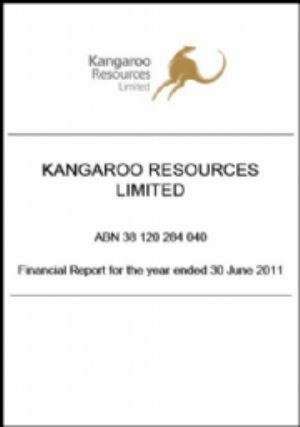 Kangaroo Resources Limited (ASX:KRL) is pleased to provide a quarterly activities and cashflow report for the period ended 31 December 2011.
International coal producer Kangaroo Resources Limited (ASX:KRL) is pleased to advise that it has executed the deeds of transfer with leading Indonesian coal conglomerate PT Bayan Resources Tbk giving it direct foreign ownership of five key concessions and one asset-holding company at the Pakar Thermal Coal Project in Kalimantan, Indonesia. International coal producer Kangaroo Resources Limited (ASX:KRL) is pleased to advise that its subsidiary, PT Mamahak Coal Mining, has signed a key five-year mining contract, with an approximate value of US$270 million, with PT Putra Perkasa Abadi (www.ppacoal.com) to mine up to 4.5 million metric tonnes of coking coal from the Company&apos;s 100%-owned Mamahak Project in Indonesia. 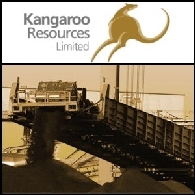 International coal producer Kangaroo Resources Limited (ASX:KRL) is pleased to announce the appointment of four experienced coal executives to its Board as non-executive Directors following completion of its landmark transaction with PT Bayan Resources TbK (JAK:BYAN). 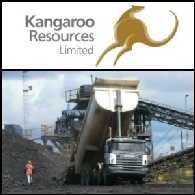 International coal producer Kangaroo Resources Limited (ASX:KRL) is aiming to join the ranks of the leading coal producers after having received final shareholder approval to complete its previously announced $277 million acquisition of the Pakar Coal Project from the leading Indonesian coal conglomerate PT Bayan Resources Tbk (JAK:BYAN). 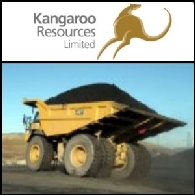 International coal producer Kangaroo Resources Limited (ASX:KRL) is pleased to report that shareholders in the leading Indonesian coal conglomerate PT Bayan Resources Tbk ("Bayan") (JAK:BYAN) have voted overwhelmingly in favour of the proposed sale of the Pakar Coal Project to Kangaroo. Asian Activities Report for April 8, 2011 includes: Kangaroo Resources Limited (ASX:KRL) reported an updated JORC Resources of 3.15 billion tonnes for its coal projects in Indonesia; Orocobre Limited (ASX:ORE) (TSE:ORL) produced its first battery grade lithium carbonate from the Olaroz Lithium Project in Argentina; UraniumSA Limited (ASX:USA) reported 42 million pounds of U3O8 inventory in the Mullaquana Project; Consolidated Tin Mines Limited (ASX:CSD) has commenced its 2011 exploration season at the Windermere Tin project in northern Queensland. Australian Market Report of March 15, 2011 includes: Kangaroo Resources Limited (ASX:KRL) is on track to complete the acquisition of the Pakar Thermal Coal Project in Indonesia by June 2011; General Mining Corporation Limited (ASX:GMM) raised A$1.2m to advance projects in Mongolia and Western Australia; Hot Rock Limited (ASX:HRL) successfully completed the first geophysical survey at its Longavi Geothermal Project in Chile; Rex Minerals Limited (ASX:RXM) reported multiple shallow high grade intersections at Hillside Copper Project in South Australia.